The majority of YEP jury members opted for Luke Ayling as their man of the match against QPR. The Yorkshire Evening Post jury signs off for another season, optimistic after a 2-0 victory over Queens Park Rangers on the final day of the 2017/18 Championship season at Elland Road yesterday, but still harbouring concerns about the quality of the squad and split between what to expect from head coach Paul Heckingbottom. Well, it was an end-of-season game but I felt it was important for the mood of the afternoon, if nothing else, that we won it, and we did. It was all fairly comfortable and we had chances to make the score even more favourable than it was, but we must resist the temptation to see it as anything other than a solid-enough win against a poor QPR. We have finished the season in pretty much the exact position that our results have suggested we would all season – 13th, neither a top-half team nor a bottom-half team. We are generally able to beat the bottom-half sides but generally nowhere near enough to compete with the top-half sides. The challenge now is to build on what we have for once and add in the quality and power and leadership we all know is missing, and then let’s see where that can take us. Please Leeds let’s not throw it all out and start completely from scratch and let’s give Paul Heckingbottom the chance to show us what he’s capable of doing with some better material to work with. 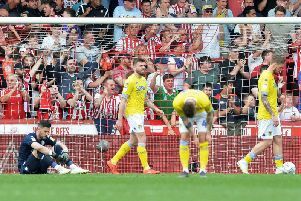 Leeds United ended the 2017/18 season with a richly deserved 2-0 win over QPR; it doesn’t disguise the fact that we have won only four games in 2018. That itself is a mockery for a club that has a fan base as big as Leeds. Things need to be a hell of a lot better when they kick off the 2018/19 season. Goals from Kemar Roofe and Kalvin Phillips were enough to see off a really poor QPR side. Like Leeds they find themselves in mid-table and know if they want to progress to a higher level they will have to invest massively to do this. The 30,000- plus crowd were bathed in the bank-holiday sunshine to witness the last rights of the current season. Luke Ayling was back from injury and he, along with Adam Forshaw and Roofe, kept the visitors on the back foot for most of the game. United head coach Paul Heckingbottom gave Ryan Edmondson 20 minutes as a second-half substitute and the 16-year-old had a decent debut, despite picking up a booking along the way. Player of the Season: Pablo Hernandez. Young Player of the Season: Bailey Peacock-Farrell. Goal of the Season: Pablo’s chip versus Hull City at Elland Road. Signing of the season: Adam Forshaw, a late arrival (January)but made a significant impression despite the poor run of results. My choice to be club captain next season. Worst signing of the season: Far too many to mention. Two bad transfer windows. The ‘David Hockaday’Trophy (three nominees): Samuel Siaz for his spitting incident at Newport County and his petulant behaviour after being substituted in the Barnsley game; Victor Orta as he gambled but lost that his ‘foreign legion’ could get Leeds into the top six in May; and whoever had the idea to tour Myanmar at the end of the season. Favourite game of the season: Bristol City at home. Two-nil down, fans on their backs then changing to the best rendition of ‘Marching on Together’ and ‘We all love Leeds’ I’ve heard for a long time, equalising and hitting the bar in stoppage time. Incredible game. The supporters of the club deserve a mention too, superb support, gallows humour and always there in great numbers wherever the team played. Where do Leeds go from here? And I don’t mean the post-season tour. Andrea Radrizzani has a choice to make, keep a head coach that has not lived up to expectations or push the reset button again and appoint his third HC as soon as possible. Myself, I’d go for the second option but this time he has to get it right or the fans might just turn on the smiling Italian. If ever a man looked pleased to be back from injury, Luke Ayling was that man. As well as performing his defensive duties in an exemplary fashion, he attacked QPR with gusto. It is said that ‘the best form of defence is attack’ and this could not have been more true. Kemar Roofe scored with a spectacular overhead kick to set the tone in a game which, for once, United never looked like losing. The second half followed a similar pattern and Kalvin Phillips lashed one home after Lumley mishit a sloppy clearance. And ... guess what? They managed the rest of the game so well that Bailey Peacock-Farrell was hardly troubled and was able to card his first clean sheet. All in all, a good afternoon with a debut for the ‘boy giant’ Ryan Edmondson and sound performances from Adam Forshaw, Ronaldo Vieira, Kemar Roofe and Tom Pearce. On balance, I feel that the senior management should stick with head coach Paul Heckingbottom, but it is a big gamble – a little, I suppose, like his appointment. Summer’s here and a spot of surfing is always tempting when temperatures soar into double figures at Elland Road. The South Stand’s ‘balmy army’ went all Beach Boys and soaked up the rays but parents of schoolkids will be feeling a little bit twitchy with those long school holidays looming ahead and that sticky problem of how to keep the youngsters occupied. Leeds United are running a scheme where you can pop them into the first team and the club will keep an eye on them for you. Ryan Edmonson’s parents dropped him off on Sunday morning and then popped round the White Rose for a spot of shopping. Ryan is a handful if not kept busy, built, as he is like a brick outbuilding and he can easily get under your feet. He burnt off a lot of energy with a right good run-around and he’ll have been off like a light when he got home, bless him. There are even outward-bounds trips and some of the little terrors will be off to Myanmar this week. Lord alone knows what they’ll get up to. Little Ronnie Vieira had a smashing time on Sunday and how quickly he’s grown up. He’s made friends with little Kalvin (Phillips) to whom lovely QPR were very kind by giving him the ball and letting him score a goal. Just to see the smiles on their faces must be reward enough for Uncle Andrea who is funding the scheme. Little Bailey Peacock-Farrell, however, did get a little bored but yours truly managed to keep him occupied by seeing who had the largest hands. He loved that. So, enjoy the summer everyone and if you have an immensely talented, athletic youngster who’s just cluttering the house up, you know what to do. Man of the match: Ronaldo Vieira. Time to celebrate, the season is over and we don’t have to see this particular flavour of Leeds United ever again. Contrary to the popular view, we have been very consistent this season – okay against poor sides and terrible against everybody else. QPR were one of the former and that meant we managed to take a comfortable, if completely meaningless, 2-0 win. If there has been a positive from the second half of the season it’s the emergence of some young talent that hopefully points the way for the future. Ryan Edmondson, an absolute giant of a teenager, was the latest with a very positive cameo in the dying moments of 2017/2018. We should be grateful that we are still in this division as our recent form would make us relegation fodder if it was extrapolated much further. There is a lot of work to be done in the summer to make sure this doesn’t happen again. In the meantime let’s enjoy a break.